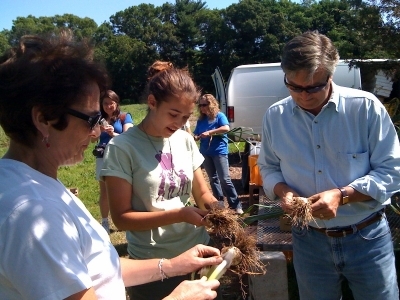 Rep. John Tierney and his wife, Patrice Tierney (left), clean garlic at the Food Project. As part of an ongoing discussion of ethical eating issues at the Northshore Unitarian Universalist Church, U.S. Representative John Tierney will speak and take questions about Congress and the food-production industries. The event will take place at the church on Sunday, September 19, from 11:45 a.m. to 12:30 p.m. Congressman Tierney has a long background as a champion of healthful and plentiful food, supporting New England’s fisheries and sustainable agriculture. A Democrat from Salem, Tierney represents the Sixth Congressional District in Massachusetts. The public is welcome. There is no charge.